Lately I find myself more attracted to properties with well-designed flow between indoor and outdoor living areas … bathrooms leaing out to a private outdoor shower, kitchens with stack windows opening up to the entertainment areas, bedrooms leading out to patios or balconies and most of all living rooms designed to open up to the outdoor entertainment areas – placing emphasis on the indoor – outdoor living theme. This sets the tone for a relaxed easy-going lifestyle while extending the livable portion of your property, creating the impression of more space. Featured in the Top Billing magazine. 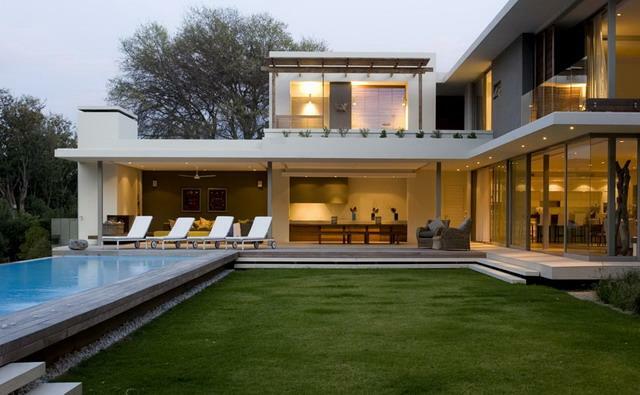 This contemporary home was designed around the swimming pool and deck. All the living areas leads through fold away doors to the quad that houses the pool and deck. This is very effective in creating a synergy between the house and the pool area. Spacious double volume living room with doors leading out to the pool and covered pool veranda. The plaement of the verander draws the eye out poast the pool, extending the sense of living space. 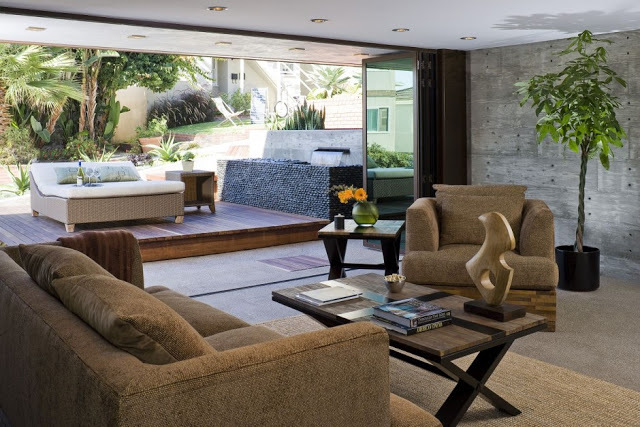 Double volume sliding doors open up this living room to form a seamless blend between the indoor and outdoor area. The dark wooden floors inside match the colour of the wooden decking outside giving the illusion that it’s all one space. 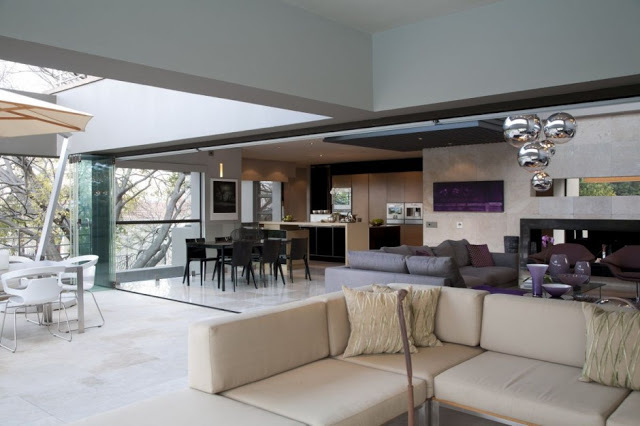 This open plan living area opens to the outdoor entertainment area through fold away doors. The kitchen has fold away windows at counter height for further scial interaction. Outside built-in benches keeps the area uncluttered. Urban living room opening up through fold away doors to the raised wooden deck with daybed. The use of “indoor” furniture outside gives an understated look. Clever use of textures throughout ties these two spaces together. 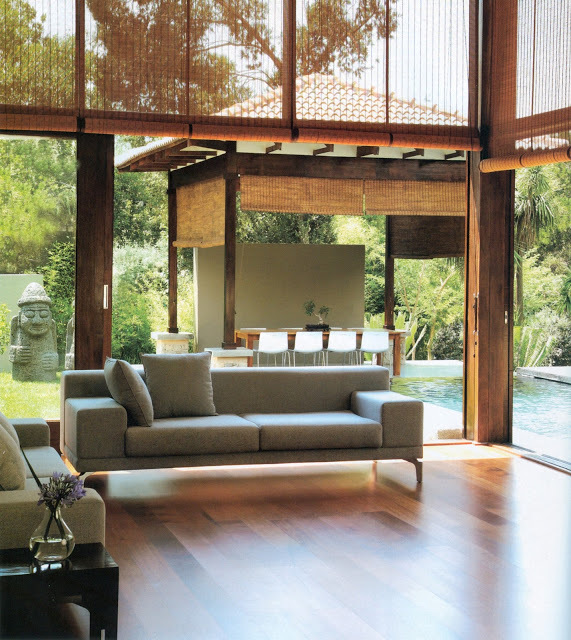 Contemporary living room flowing seamlessly to the pool and outdoor entertainment area. Strong line both inside (furniture) and outside (box shaped fireplace) helps create the flow between the spaces. Furthermore the swimming pool running from where the living room opens to the fireplace area enhances the unified look. 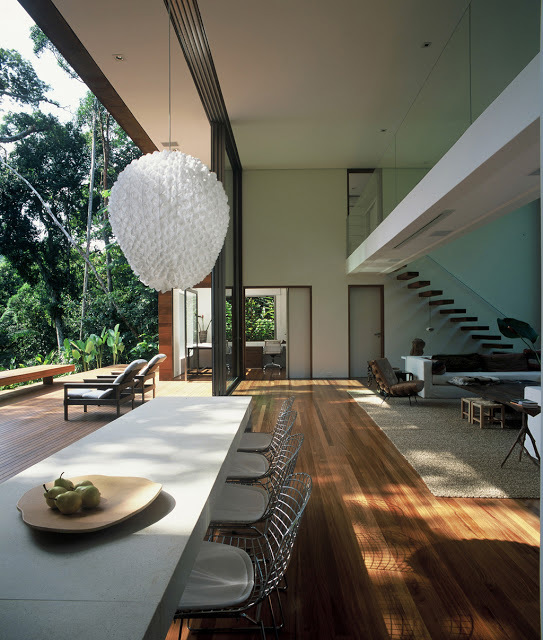 Architectural designed house with perfect flow between the indoor and outdoor living areas. Multiple areas for different functions all tie together with the use of the sandy coloured furniture and seamless floor surface. 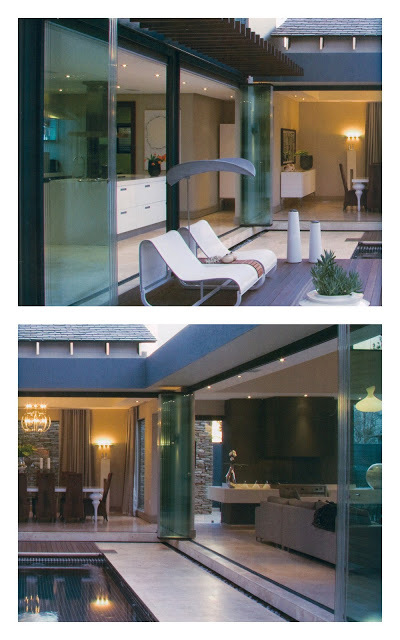 Use of the waterside veranda, the stretched out pathway over the waterfeature lining up with the long narrow pool running straight out to the end of the property and the different levels in the garden all works together to draw the eye out to the end of the property – maximising the sens of space. 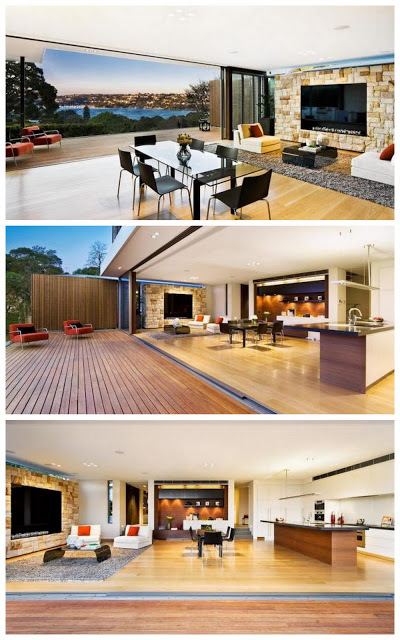 Amazing oudoor living spaces designed in form and layout to allow a perfect flow between indoor and outdoor areas. 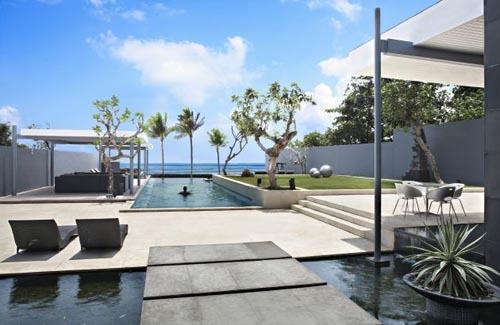 The mulitple outdoor areas allows the indoor-outdoor living theme both in summer and in winter. Big sliding doors opens this spacious open plan living area up to the wooden deck outside giving the feeling of endless space. The open plan living area speaks of easy-going contemporary living – the perfect combination for a view like this!